Colorado’s #1 RV Dealer for Towables- Amazing Selection, Great Price! Now is the time to get out and get camping. Spring is here (finally!) and summer is closing in on it’s heals. This means time is running out to purchase a new travel trailer to take full advantage of the camping season. You’re in luck, because no one knows camping like Windish RV. 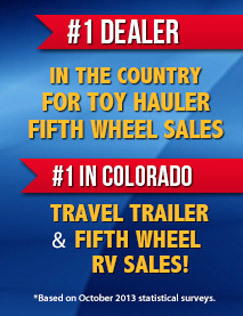 Windish RV is Colorado’s #1 Towable RV Dealer for the past 7 years! Being the #1 dealer in Colorado means we have the best selection around at the best deal. Volume business allows us to carry more travel trailers, fifth wheels and toy haulers in stock and offer them at a competitive price. Our friendly, knowledgeable sales team is here to help you find the perfect RV to fit your camping needs. Choose from top manufacturers such as Grand Design, Airstream, Keystone, Heartland, Forest River, Dutchmen and more! We are proud of the brands we carry because we know what will make our customers happy. See for yourself! With locations in Longmont, Lakewood/Denver and a third location opening soon in Colorado Springs, you don’t have to travel very far for your perfect RV. Get Directions to Windish RV. Folks even come down from Canada to get a great deal with us, so whether you’re from the Rocky Mountain area or north of the border, we have just the right towable RV to make your camping experience a success. But don’t take our word for it. See what Our Customers have to say about us! You will find our Financing Department to be quick and efficient. Windish RV has developed numerous banking relationships that specialize in RV financing at competitive rates and terms for your convenience. We also have actively sought out lenders that have programs for those with credit challenges. You can even Apply for Financing Online. Your dream RV is waiting for you at Windish RV. Contact Us to day for a personal tour!